Location: Lake Texcoco, Valley of Mexico. Grid Reference: 19° 26' N, 99° 8' W.
Tenochtitlan, the Capital of the Aztec empire, was built on a cluster of small natural islands on Lake Texcoco in the Valley of Mexico. The founding of capital city in the middle of a marshy lake may at first seem absurd, but its exact location was foretold and fulfilled by prophesy, and Tenochtitlan indeed grew to become the largest and most powerful city in Mesoamerica, and at its height was one of the largest cities in the world. The city was originally built by the Aztecs in 1325 as Tenochtitlan, which was almost completely destroyed in the 1521 siege of Tenochtitlan, and subsequently redesigned and rebuilt in accordance with the Spanish urban standards. In 1524, the municipality of Mexico City was established, known as México Tenochtitlán, and as of 1585 when it officially became known as La Ciudad de México (Mexico City). Tenochtitlan was the capital city of the Aztec civilization, founded in 1325 by the Mexica people. The Aztecs, or Mexica as they called themselves, were not originally from the Valley of Mexico, but had migrated from the north (from a mythical island called Aztlan, "The Place of Herons") Historically, it is known that the Mexica and other tribes located in northern Mexico and the southwestern United States, known as the Chichimeca, left their homes because of a great drought. This story is told in several surviving codices, in which the Mexica are shown carrying with them the idol of their patron deity Huitzilopochtli. After two centuries of migration, at around AD 1250, the Mexica arrived in the Valley of Mexico. When the Mexica finally arrived in the Valley of Mexico, the earlier great cities of Teotihuacan and Tula had been abandoned for centuries and other groups of people were already settled on the best lands. Because of this the Mexica had a troubled time and were forced to settle on inhospitable land. 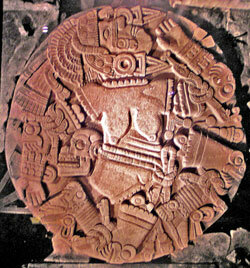 They became vassals of the city of Culhuacan, a prestigious city whose rulers were considered the heirs of the Toltecs. It is said that in acknowledgement for their assistance during battle, the Mexica were given one of the daughters of the King of Culhuacan to be worshipped as a goddess/priestess. When the king arrived to attend the ceremony, he found one of the Mexica priests dressed in the flayed skin of his daughter: the Mexica reported to the king that their God Hutzilopochtli had asked for the sacrifice of the princess. The sacrifice and flaying of the Culhua Princess provoked a ferocious battle, which the Mexica lost. After they were forced out of Chapultepec, according to Mexica myth, the Aztecs wandered for weeks, searching for a place to settle. Huitzilopochtli appeared to the Mexica leaders and indicated a place where a great eagle was perched on a cactus killing a snake. This place, in the middle of a marsh with no ground-rock at all, was where the Mexica founded their capital city, Tenochtitlan. 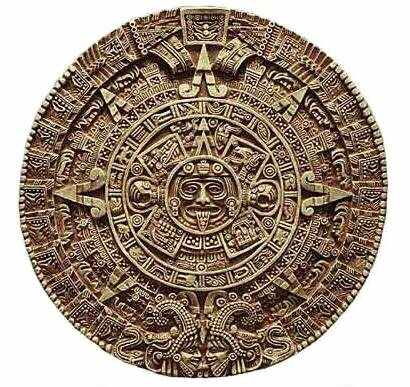 The year was 2 Calli (Two House) in the Aztec calendar, which translates to AD 1325. 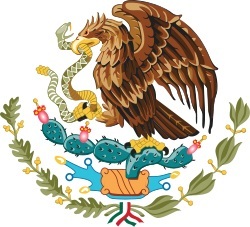 The vision is immortalized in Mexico's coat of arms and the centre of the Mexican flag. A thriving culture developed, and the Aztec civilization came to dominate other tribes all around Mexico. The small natural island was perpetually enlarged as Tenochtitlan grew to become the largest and most powerful city in Mesoamerica. Commercial routes were developed that brought goods from places as far as the Gulf of Mexico, the Pacific Ocean and even the Inca Empire. Only 100 years after its conception, Tenochtitlan had become a city that rivalled any of its European contemporaries and perhaps any in the world. Scholars estimate that between 200,000 and 250,000 people lived in Tenochtitlan in 1500, more than four times the population of London at that time. 'When we saw so many cities and villages built in the water and other great towns on dry land we were amazed and said that it was like the enchantments (...) on account of the great towers and cues and buildings rising from the water, and all built of masonry. And some of our soldiers even asked whether the things that we saw were not a dream? (...) I do not know how to describe it, seeing things as we did that had never been heard of or seen before, not even dreamed about'. 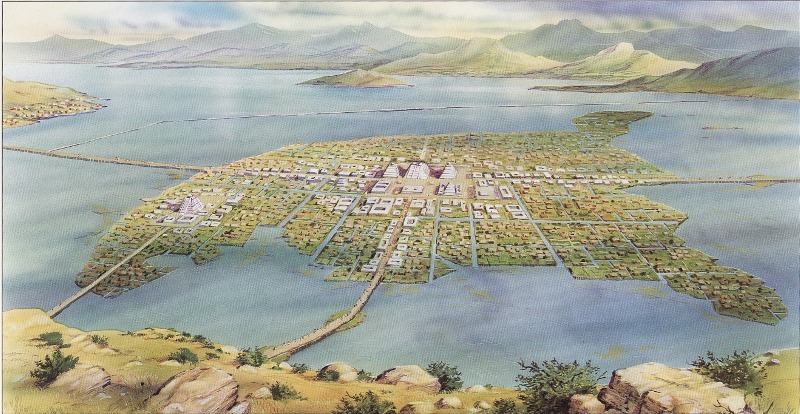 Artistic impression of Tenochtitlan at its height. The Aztec capital of Tenochtitlán (at modern Mexico City) was founded in 1325 on a muddy island in the lake which at that time filled the Basin of Mexico. A second group of Aztecs also settled the nearby island of Tlatelolco in 1358. Both sites began as small collections of reed huts but, with the growth of Aztec power, quickly developed into cities, eventually fusing into a single unit. Tenochtitlán was joined to the mainland by three causeways. An aqueduct supplied fresh water from Chapultepec. Along with the many palaces and marketplaces of the city the Tecpan, a central plaza contained the two principal temples, built on a huge terraced pyramid (El Templo Mayor). By 1519, the year the Spaniards arrived, Tenochtitlán had a population of more than 200,000. It was laid out on a grid plan and covered more than 12 km2 (4.6 mi2), much of this consisting of reclaimed swampland that formed a zone of fertile garden plots around the edge of the city. The Aztec city-states in the valley were an extremely proficient hydraulic society. They used bridges, causeways, dikes, sluices, canals, aqueducts, terrace farming, and chinampas (artificial, floating gardens) to sustain the population and allow for navigation about the city. A 16-km (10-mi) dike sealed off part of the lake and controlled flooding, so that Tenochtitlán, like a Mexican Venice, stood on an island in an artificial lagoon. Causeways linked the island to the lakeshore, and canals reached to all parts of the city. The Tenochtitlans used the aqueduct water from Chapultepec for bathing and cleaning and they used mountain spring water for drinking and cooking. At the centre of Tenochtitlán was a large walled precinct, the Teclan, presumed to be the focus of ceremonial and sacred activity, containing the main temples (dedicated to Huitzilopochtli, Tlaloc the Rain God, and Quetzalcóatl); also found there were schools and priests' quarters, a court for the ritual ballgame, a wooden rack holding the skulls of sacrificial victims, and many other commemorative sculptures. The largest structure of the complex was the Templo Mayor, said to be the very location of the fulfilment of the Aztec prophesy. El Templo Mayor, built in the heart of the city and the largest building, said to be the location where the prophesy for building the city was fulfilled. According to Aztec legend, when Coyolxauhqui was killed on the summit of Coatepec by Huitzilopochtli, her beheaded body was torn apart when it fell down the mountainside. A monument to Coyolxauhqui, thus, would be expected to be found at the foot of a "mountain,". Excavation soon revealed huge serpent heads, which turned out to flank stairways to the temple top where, as might be expected, there was a shrine to Huitzilopochtli. The Templo Mayor had been found—and in the following years large parts of the sacred precinct over which the Temple presided were revealed. The stone is on view in the nearby Templo Mayor Museum. This first temple was a simple structure made of mud and wood, but construction of the Templo Mayor began in the year designated 2-Rabbit (1390). It was subsequently re-built seven times and enlarged eleven times - the last time in 1487, when several thousand people were sacrificed over 4 days during its re-consecration (The remains of which were discovered in a pit at the base of the monument). As befitted its importance, the Templo Mayor was always the tallest structure in Tenochtitlán. In the last stage of construction, dating to the time of the arrival of the Spaniards, the pyramidal platform was composed of four sloped tiers with a passage between each level, built on a great platform that measured approximately 80 x 100 meters. It had two stairways of access to the top, where there were two shrines dedicated to Tlaloc on the left side, and to Huitzilopochtli on the right side. The two temples, at approximately 30 meters in height, were originally covered over entirely with stucco and polychrome paint. In 1790, workers doing repairs in Mexico City unearthed a massive stone bearing ancient symbols. It turned out to be a vast representation of the Aztec calendar and is now a national treasure. 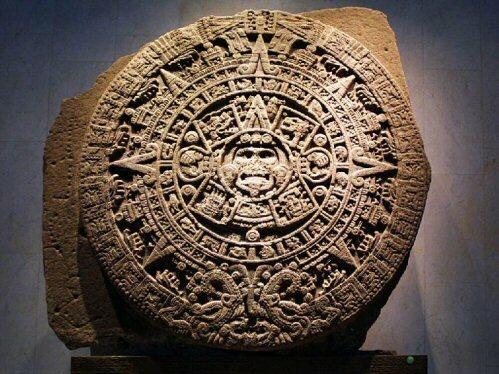 The famous Calendar Stone of the Aztecs was found within the walled Teclan precinct. The disc-shaped stone measures 12 feet in diameter and is 3 feet thick. Being covered with unknown symbols, the Spanish decided to bury it underneath the Zocalo, or central plaza of the city soon after they toppled the Aztec empire in 1521. The new rulers also tore down the grand temple and, at the opposite end of the plaza, built a large cathedral. Soon after its 1790 discovery, the 25-ton stone was embedded it in the wall of the cathedral's western tower. When Mexico achieved independence from Spain in the early 19th century, it retained the Catholic religion but also developed a growing interest and pride in its indigenous history and culture. General Porfirio Diaz ordered the stone removed to the national Museum of Archaeology and History in 1885. There are several theories for how the stone was used. it may have been simply a monument or possibly a sacrificial altar. In the centre is the terrible sun god, Tonatuih (some believe this may be the earth god). Each of his hands holds a human heart, and his tongue is a ritual blade for sacrifice. The four squares that come next supposedly show the four previous creations that perished (by jaguars, wind, rain and water). Next come the 20 signs for the days of the Aztec month. The 5 dots are the 5 unlucky days, days of sacrifice. Finally, surrounding the Aztec calendar stone there are the snakes that come head to head. The symbols may represent the 52 years in a cycle. Between the tails is a symbol probably showing the date the stone was carved. At the edge are 8 equally spaced holes. The horrific siege of Tenochtitlan has a well deserved place in the human hall of shame, but there no hiding from the hidden irony in the fact that the city which was founded on prophesy, also fell by it, something which offers the possibility of a connectivity beyond the range of modern perception. Before the Spanish had even landed on the Americas, their arrival was foretold in the shape of an ancient myth which said that Quetzalcoatl would return from the east (on the very year they arrived - 'Reed 1' of that 52 year cycle, or 1519). The prophets of Mexico had long predicted that Quetzalcoatl, or the Feathered Serpent, would return to claim the land that was once his and the kingdom would be his to reign over. When Hernado Cortes arrived that year, they believed he was the god that was foretold. he came with 16 mounted and armed soldiers, several hundred people including 550 soldiers, 100 sailors, 200 Cubans, a few Africans and a number of women. they had come on 11 ships total. the Aztecs called them “floating mountains" and sent word to the King, Moctezuma, the king of the Aztecs. Cortez set towards Tenochtitlan, a path which led to the slaughter of 15 - 30,000 in Cholula alone before he reached the capital. In the process, through fear and pure guile, he managed to 'convert' several thousands of peripheral tribes to join him in overthrowing the yoke of the Aztec Montezuma. Cortez arrived at Tenochtitlan playing the role of returning King, and now fully aware of the prophesy. Moctezuma welcomed Cortés into the Aztec capital on November 8, 1519. The last Aztec emperor, Cuauhtémoc, surrendered to Cortés on August 13, 1521.